In my arrogance I thought this would be such an easy task, and coded a utility in less than an hour. Sent it off to Steve to try, and when he emailed me back I realized how tough of a problem this is. It would be easy to find EmptyFolder1, and EmptyFolder2. But now that they are removed, Folder2 is empty as well. This means you need to delete the deepest paths first, and work backwards. Lots of special cases like this, and that is what makes it much more difficult than I originally thought. Over a few weeks, Steve was gracious enough to work with me and develop a solution that worked well. Please – Please be careful with this utility. It only deletes empty files and folders, but it is always possible that you have a program that *needs* those empty folders. So make sure you throughly test before using it. As always, there is no spyware, adware – only IntelliAdmin Goodness. Great tool steve. I really needed something like this – got a program here that creates folders named after the current date, and then leaves them behind. This will be a perfect way to keep that folder clean now. Thanks for the freebie steve. DelEmpty.exe dosent work in windows 7.plz tell me how its work…. Sure it does. That is the version of Windows that I mostly tested and built it on. What type of error are you getting? Got it all working steve from a bat file. Great utility. Thank you so much for making this free! Glad to hear it David. Email me if you have any more issues getting to work, and I will be glad to help. I would like to have a BAT file of this job. But comes up with no empty folders to delete. I know there are empty folders as I’ve even created a few for testing. The prompt comes back within a second, even though there are upwards of 800 000+ files/folders in this drive. I am the sysadmin for the company and have full admin rights on all drives. Try it with the -l and -v options…do you get any output? This should list what the program can see. I can’t get this to open at all. I know how to run a command prompt, but when I double click this it just flashes real fast. I am running Windows 7 (x64) HP. Could you give me a heads up on starting this. Please and thank you. This is a command line program. 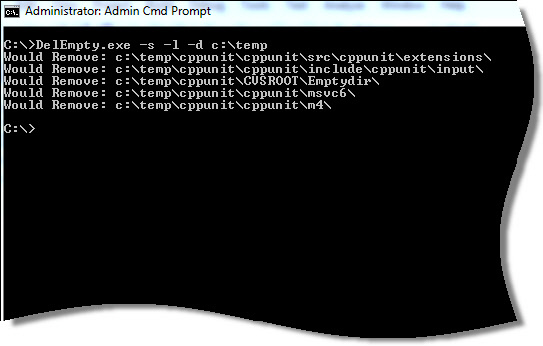 You will need to get to a command prompt first, and then call delempty from there. Please be careful as this is a deletion tool…make sure you use the testing options first to see what it will delete. I am having the same problem as Patrick on a non-network drive. I’ve tried it from the root of the drive and otherwise. I am also running as an admin. I like to think of it as a feature since my finger just slipped and hit the enter key right after I hit the “\” key. Just about freaked out thinking that I erased all the empty folders on that drive. Not that it would have hurt much but I need some of those empty directories. Also, I tried the -l option with a space after the “e:\” (so that it would be “e:\ “)and it found all the empty directories on the drive. This is a great utility.Could you please help by giving me a batch file command to automate the process? Thank You! Thanks. Worked for me, but noticed the tool wouldn’t work on root folders. We are using a system that creates PDF files, and every now and then, it creates a zero byte PDF file. When it does, the UNIX system that attempts to read that file, breaks down, the Unix administrator on that side was unable or unwilling to create a simple script to delete those zero byte files. Your DelEmpty.exe was a brilliant, practical and most efficient solution. Thank you.